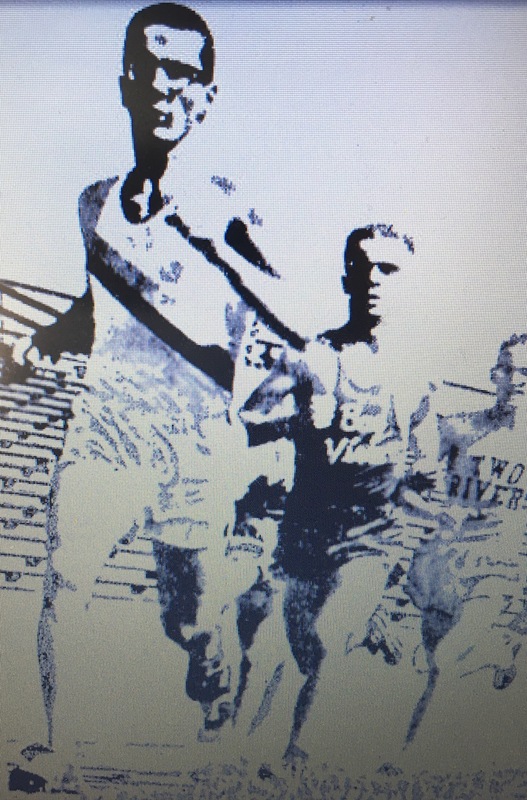 Les Larson of South Milwaukee wins his first state title in 1941. 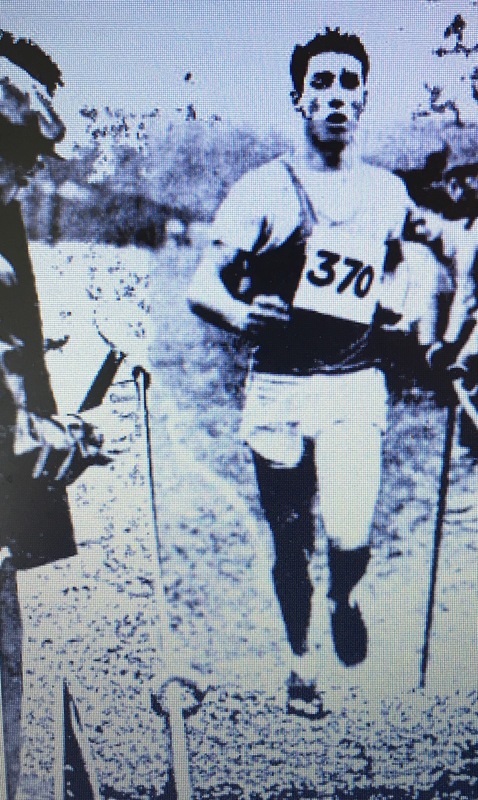 He took 2nd in 1940 to Russ Winkel of West Allis, and he would repeat as champion in 1942. 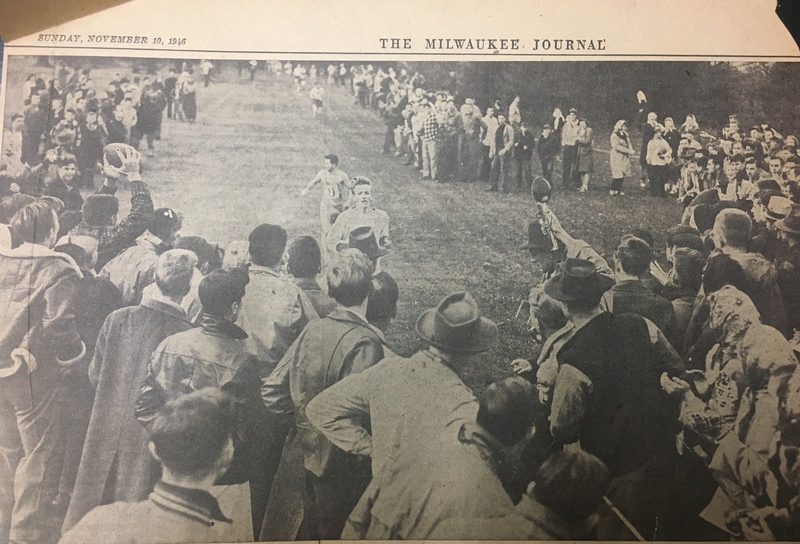 South Milwaukee won the team championship in 1940 and 1941. 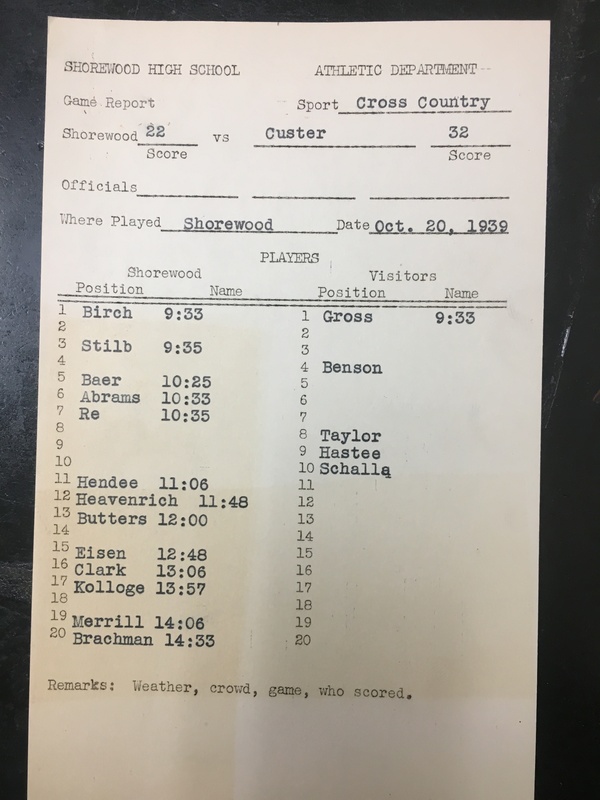 I’m confident the picture below (from the 1914 Milwaukee Normal School yearbook) was taken the day of the mysterious first State Meet held in 1913. There was likely more than one race that day, so who knows who is in the picture. That start is pretty good. 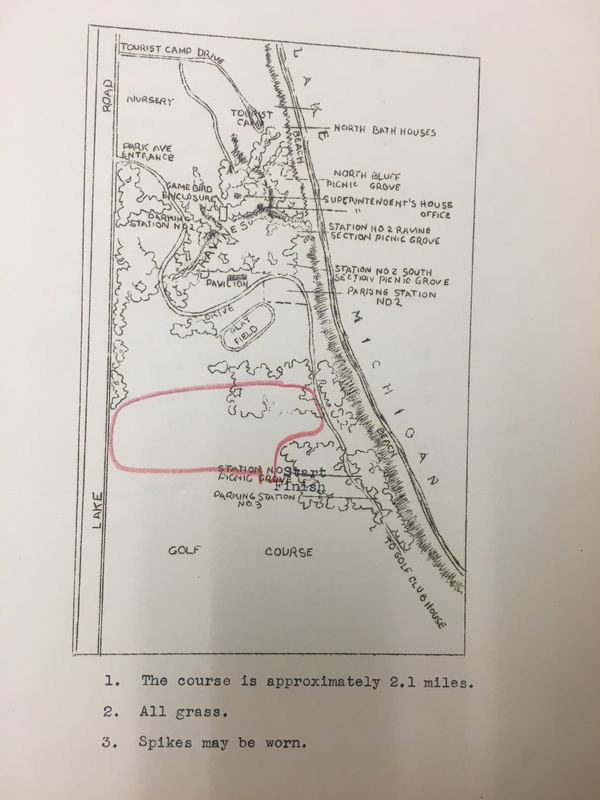 If that building still exists, we could probably pinpoint the exact location of the start. I don’t know if even I am that nuts. Thank you for posting that picture. That is one of the most frustrating and mysterious pieces of data out there; that we have a picture of the top five finishers but don’t know who they are or what order they finished. From the 1913-1914 Riverside yearbook, I can confirm that their top finisher was a runner named Robert Smith, who came in 5th place. 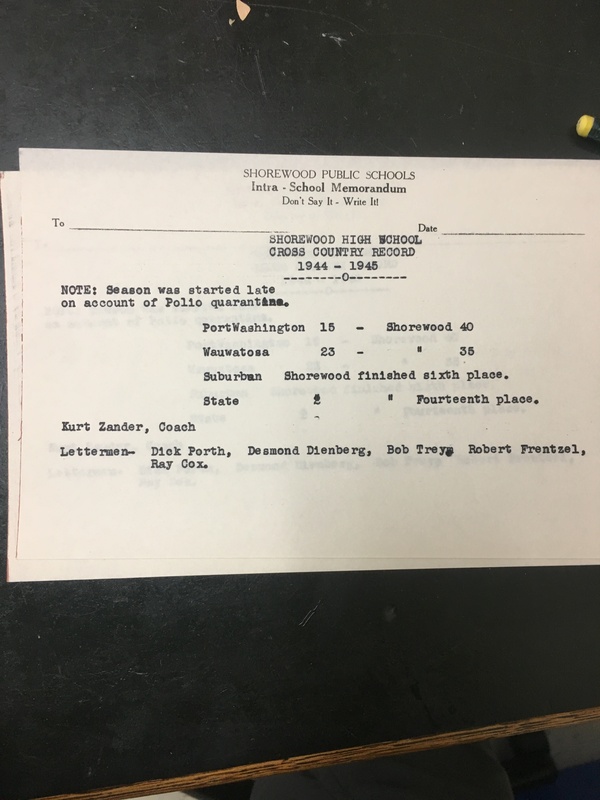 The rest of the top five for Riverside that day were Ed Merten, C. Engelhardt, Kenneth Head, and “Schlaeger,” but no places were given for them. 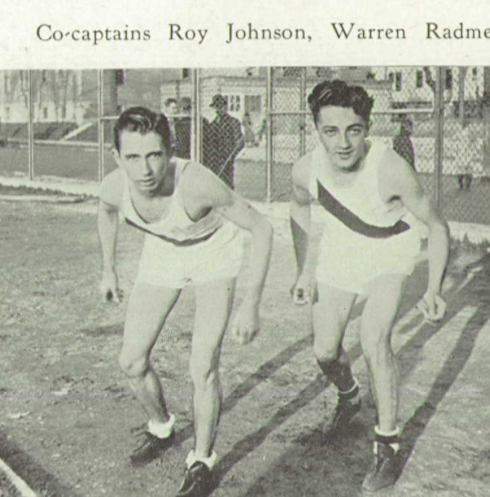 It is possible that one of the athletes pictured is 1914 state champion Roy Donovan of South Division, but that is just speculation on my part. 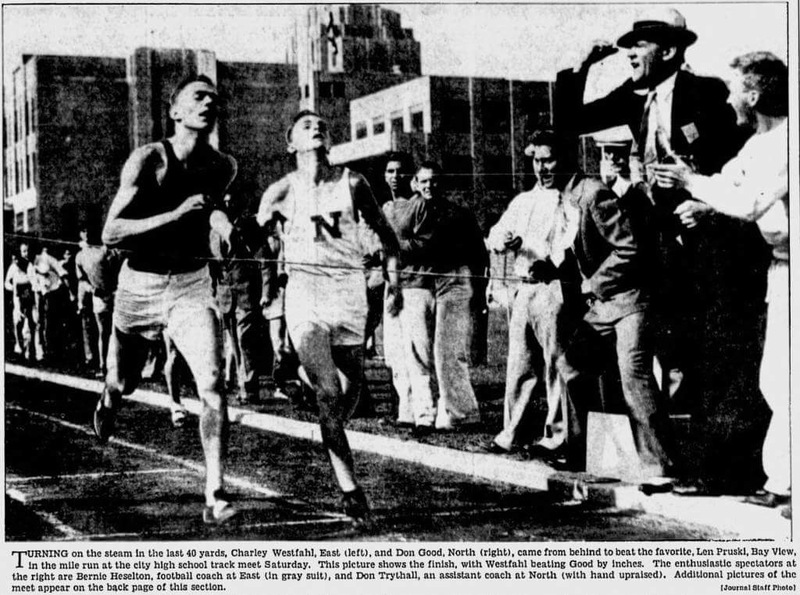 Charles Westphal of Riverside and Don Good of Milwaukee North running the mile at the City Conference meet, probably in 1934. 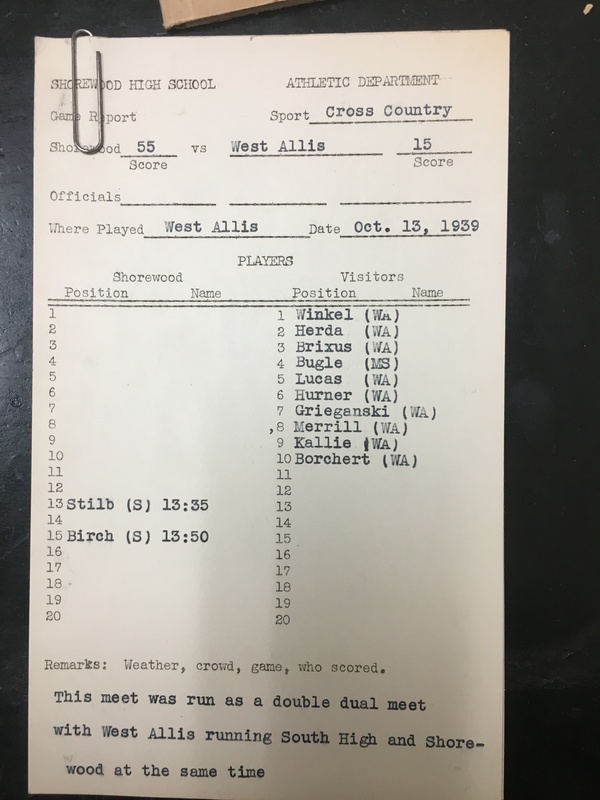 Westphal was cross country state individual champion in 1933 (the last of the line of Riverside champions), and Good was state runner-up in 1935. Picture courtesy of @zen. 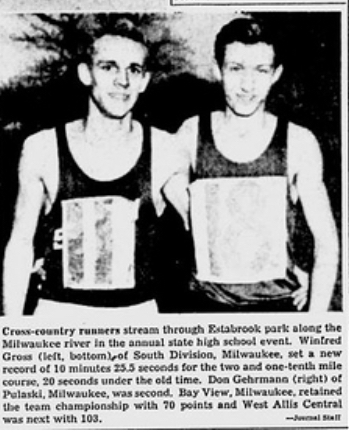 1944 state champion Winifred Gross of Milwaukee South with 1945 state champion and future Badger All-American Don Gehrman. Picture courtesy of @Biff. 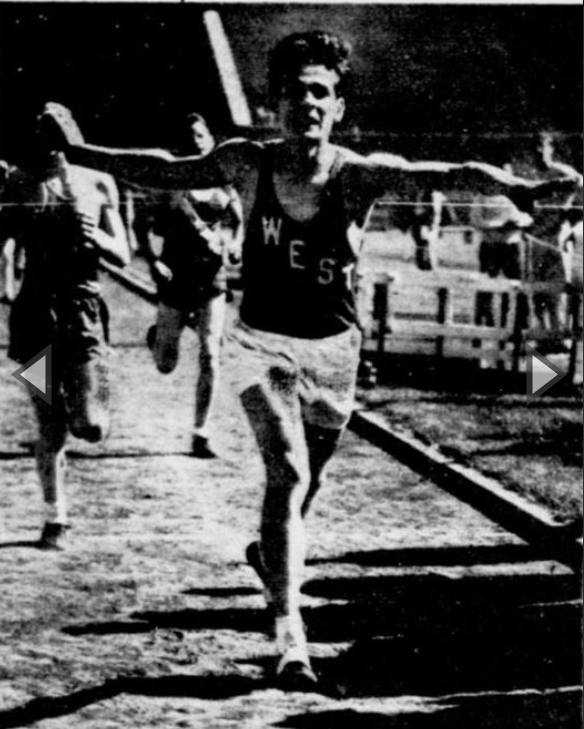 Two-time City Conference CC champ and 1949 state Mile champion Carroll Sternberg of Milwaukee West. He would go on to compete for the Badgers in cross country, track, and boxing! Picture courtesy of @Biff. 1954 CC state champion, 1953 state runner-up, and 1955 state mile champion Harold Struck of Milwaukee South. 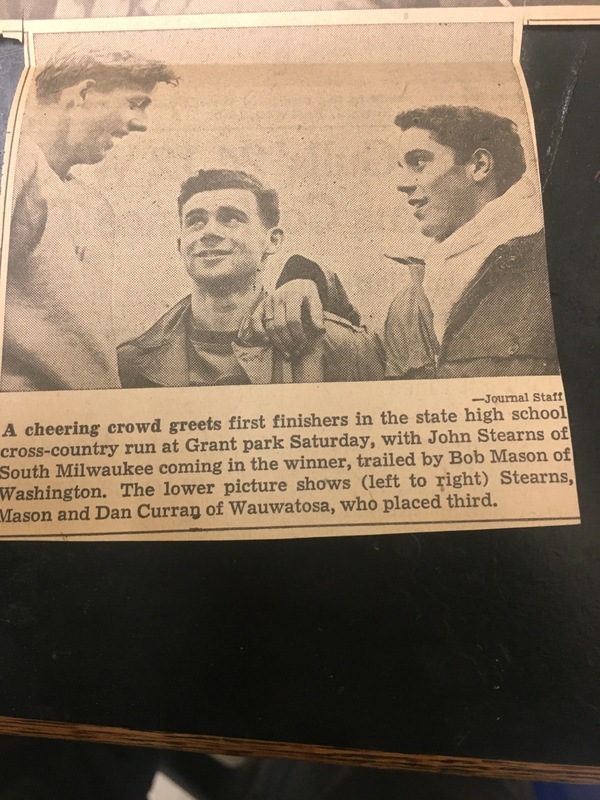 He also took 5th a state CC in 1952, and was 3rd at state in the mile in 1954. Picture courtesy of @Biff. 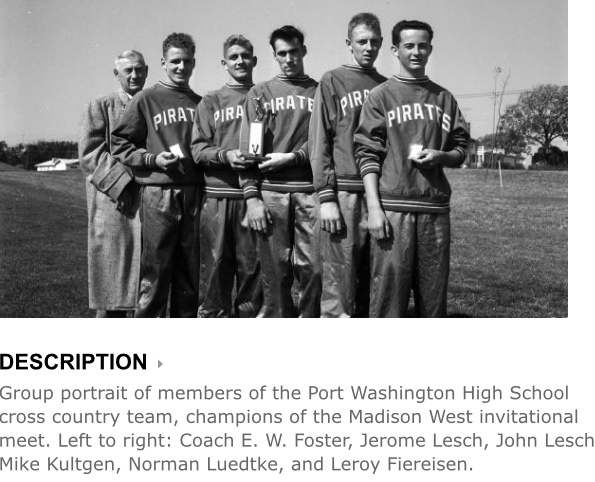 Picture of the 1957 D3 state cross country champions from Port Washington (competing at Madison West). 1956 and 1957 individual state champion Eric Lesch is third from left. He later competed at Marquette University. To the far left is head coach Earl Foster. 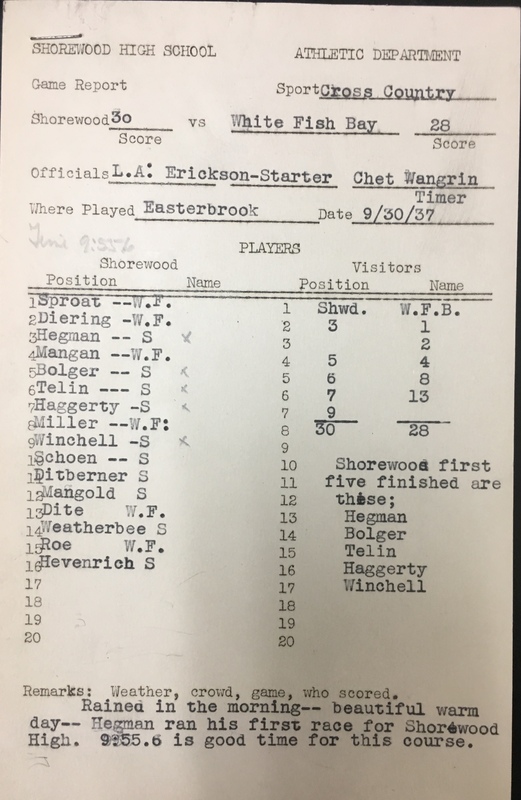 In addition to the ‘56 and ‘57 teams, he coached PW to the 1933 Class B state title, and an (uncredited) Class B title in 1934. He also coached Monticello to Class B state titles in track in 1922 and 1924. Foster coached a number of individual state champions in track. 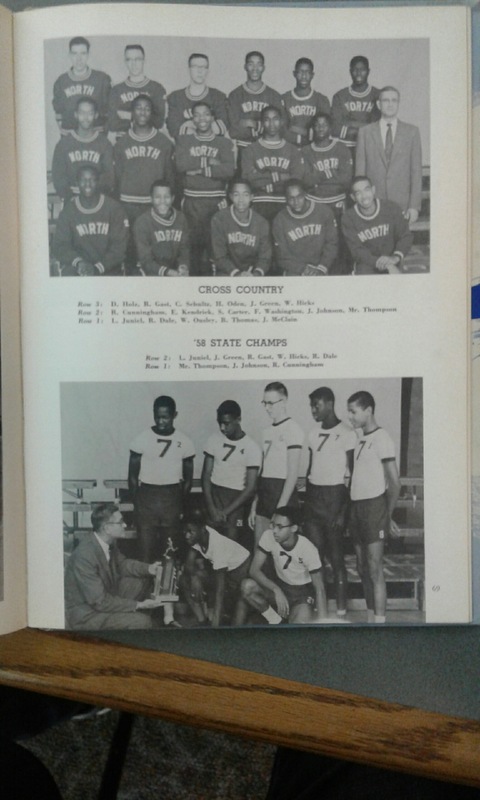 Yearbook photos of the 1958 Class B State Cross Country champions Milwaukee North, coached by Elmer Thompson. Picture courtesy of @zeeeblob. Battle of state champions. Greg Gard of Granville and Bob Meehan of Bay View. Unsure of the identity of the Two Rivers runner. 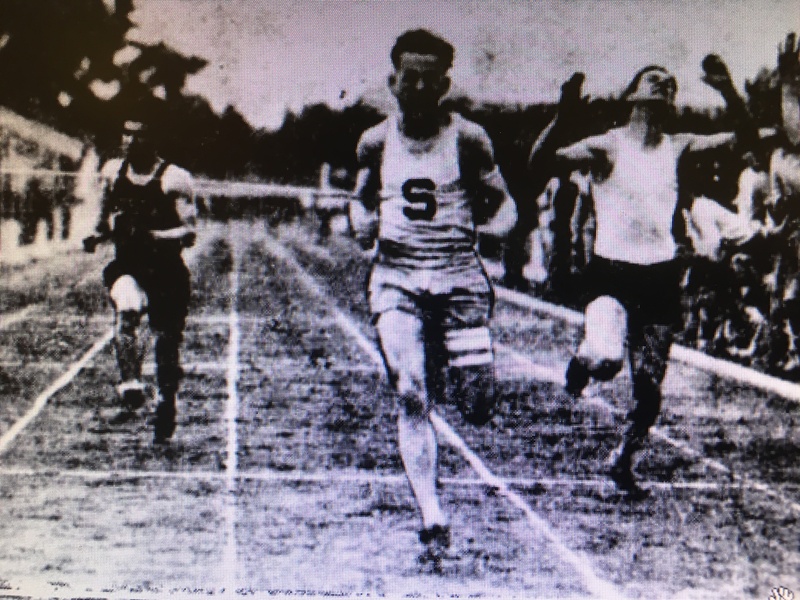 1928 and 1929 state 100 meter champion Charles Blech of Shorewood. Senior picture of 1913 and 1914 state 880 champion Edgar Steubenrauch of Sheboygan. He also placed in the 440 each year, but due to the weird heat system it is hard to discern what place he actually got. Steubenrauch became a nationally famous architect. Ralph Christofferson of Chippewa Falls, state champion in the high jump in 1920, state champion in the broad jump in 1920 and 1921. He attended Ripon College. 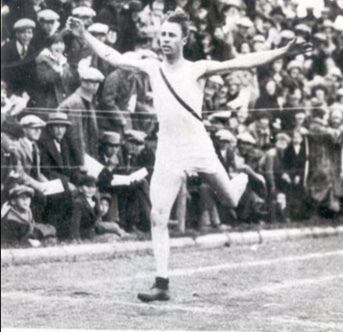 Christofferson qualified for the US Olympic Trials in the broad jump and triple jump in 1924. Later in life he was the principal at Madison West. 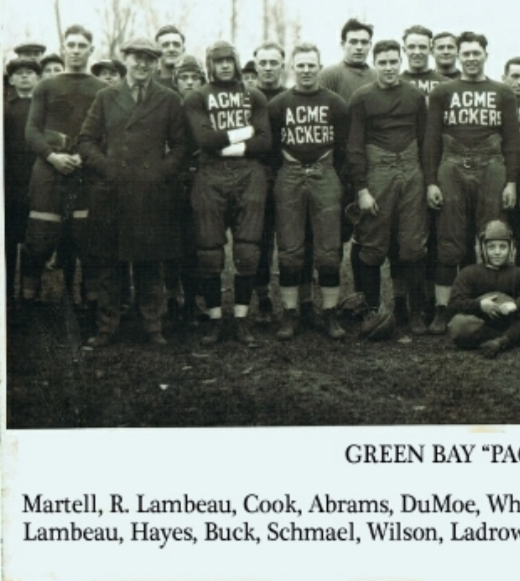 Third from left with arms folded with the ACME Packers jersey and leather helmet is James Cook from Green Bay East, state champion in the discus in 1906 and 1907. He attended Notre Dame and played football there. 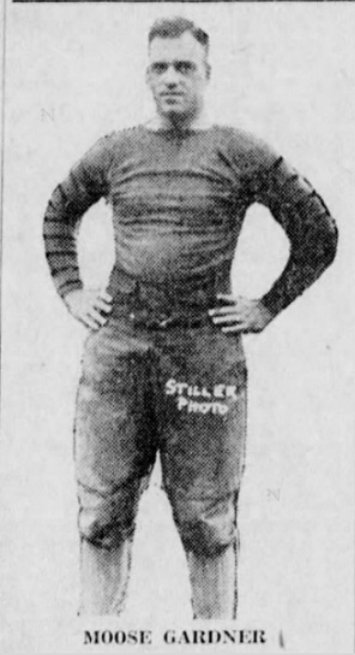 After a large period of unaccounted for time, he ended up playing one season in the NFL (1921) for the Green Bay Packers. football coach at Northland College from 1931-1936. 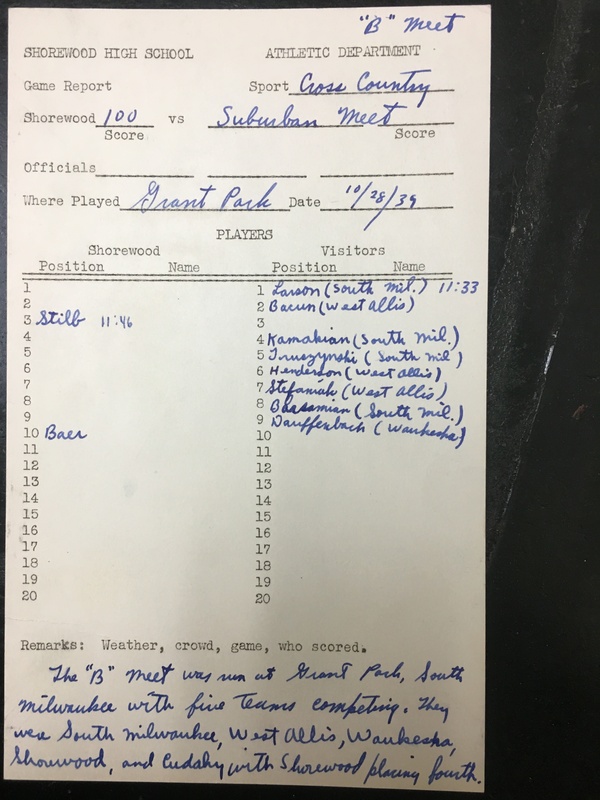 Older Score cards. I have some results that goes back to the 1920’s. I’ll take some screen grabs if there’s any interests. Season started late in 1944–1945 on account of a Polio quarantine.